Wouldn’t it be nice if you could always remember to soften butter before you needed to use it? Well, it’s good to dream. But if you live in the real world where nobody’s perfect (and last-minute snack attacks do happen), there are some ways to soften butter at the last minute without getting the melted mess the microwave inevitably causes. That’s right. Don’t use the microwave. Or the stovetop. Doing so can cause it to melt or soften unevenly, which can cause unexpected results in many recipes. But there are several options to soften the butter more naturally. The minute you realize you’ve forgotten to soften the butter, pull it out, and cut it into small cubes. Place the cubes in a single layer on a dish, and set it aside to soften while you measure and prepare the rest of the ingredients. It should be ready in about 20 minutes. 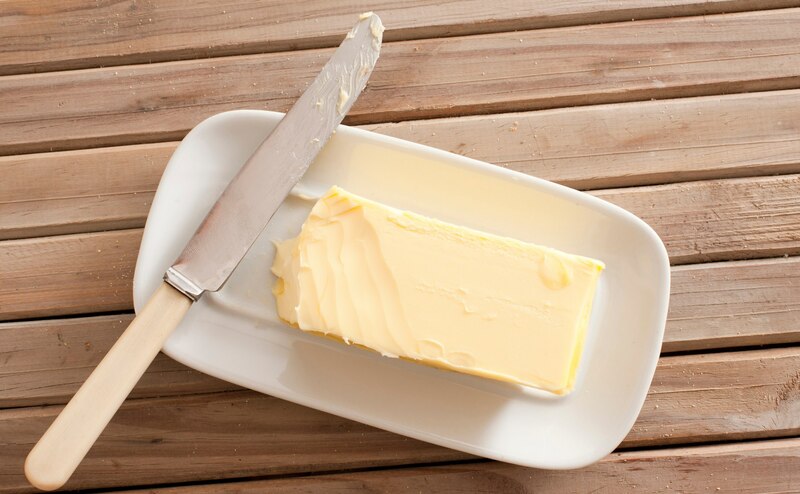 It works because cutting the butter exposes parts of the butter that would otherwise be protected from the room temperature air, increasing the exposed surface area, which means it absorbs the heat in the room faster. This is exactly the same thing as taking the entire stick or a portion of the stick out of the fridge and setting it on the counter; it just goes faster. You lose very little butter on your knife and hands, so the measured amount is essentially the same. Grating the butter follows the same principle as cubing the butter but creates even more surface area. Additionally there will be increased friction from the grating process, and since you’ll have to touch the butter, heat will transfer from your hands. I don’t recommend using a food processor for the grate unless you’re refreezing it for an application that takes extra-cold butter, like pie crust or biscuits, as the food processor will generate even more friction, which probably won’t actually melt it but will make it very tough to handle and scrape off and out of all the parts. Just use a box or handheld grater with large holes, and grate it just like you would cheese. But do so quickly, as the heat from your hands will cause it to get messy fast. The upside to this method is that is softens even faster than cubing — it may be soft as soon as you’re done, but if not, check again in about five minutes. The downside is that it’s much messier and you risk using more butter, which will melt to your hands and stick to the grater. In most applications, butter loss is still minimal and not likely to cause much of a problem, but you can always remeasure it if you need to. Again, here you’re increasing the surface area, with the added bonus of a little extra friction. The upside is that it’s less messy than the grater (or really, even the knife). The downside is that some people find it a bit awkward, especially if your fridge makes your butter a bit stiffer (it can tend to slide around a bit instead of flatten at first). Another downside is that it relies on waxed paper, which is something you can run out of (whereas once you buy a knife or grater, you always have it barring it breaking). But it does work really well. Just place the butter between two pieces of waxed paper, gently smash it with a rolling pin (just to take some of the height off), and then roll it out like pie crust dough until it’s about a 1/4 inch thick. In a pinch, you can use a zip-top bag as long as it’s big enough to roll out the dough, though it’s a little tougher to get out of the bag. But don’t ever use plastic wrap or foil, which will get mangled or stick to the butter or your rolling pin. When it’s the right thickness, peel away the waxed paper, turn it out onto a plate, and let it rest for up to three minutes. This is probably my favorite method for serving butter as a condiment at dinner because it leaves your butter intact so you can cut it into nice pats to top mashed potatoes or corn on the cob or to slather on your favorite homemade bread. Instead of using higher heat methods like the stovetop, microwave or a double boiler, which have a high risk for melting (which is not ideal for serving it at dinner), it uses a much gentler heat. Cut the butter into a piece small enough to fit under a glass. The larger a piece of butter you need, the larger a glass you need. It needs to be glass or ceramic, not plastic, which doesn’t retain heat as well. Set the butter on a plate or saucer next to the sink. Grab a paper towel too; you’ll need that shortly. Fill a glass with hot water, and let it sit for a few minutes until the heat of the water begins to transfer to the glass. The glass will feel warm on the outside. Then just dump out the water, give it a quick wipe with a paper towel, and immediately cover the butter with it. In one to two minutes, the butter will be softened and still be presentable for the dinner table.